I haven't been able to do much in the way of textile arts since having a trapeziectomy (removal of a small bone) on my right wrist about 6 weeks ago. While my wrist was swathed in plaster and heavy bandages, I couldn't do much more than wriggle my fingers. 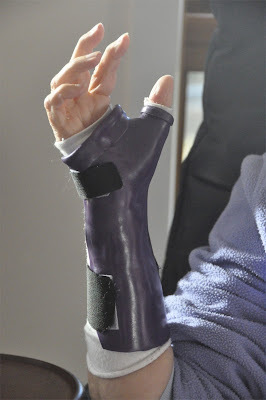 After 2 weeks, I progressed to a rigid plastic splint, which allowed me much greater use of my fingers. 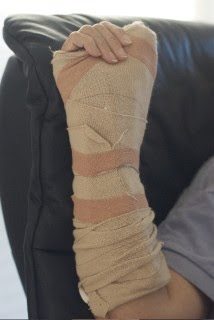 I'm now wearing a soft splint and feel almost normal but still won't have that whole opposable thumb thing working for another 6 weeks. However, I should be able to resume driving in about 2 weeks and I can do some needle-felting - just nothing very complicated. You sure have had a bad time Monica--I hope all end up well for you. Glad that things are starting to improve Monica. It must be so frustrating for you.